This year Hope for HH is celebrating its 10th Anniversary! Over the next year, we look forward to sharing some of our greatest achievements in the last decade and developing our vision for the next 10 years! As part of our vision for 2019, we will be focusing on 3 C’s. They are: Comorbidities, Community and Caregivers. The First C is Comorbidities. This year we will be focusing on gaining a better understanding of the entire range of symptoms that make up the HH condition. For too long, medical professionals have been focused almost exclusively on the tumor/lesion itself and the seizures it causes. However, we know through our collective community experience, there is much more to this rare condition that impacts patients and their Quality of Life besides seizure activity. Hope for HH is excited to announce our 4th International Professional Symposium that will take place in Washington DC this Fall. The focus of the conference will be on developing a better understanding of HH and comorbidities. We have invited experts from across the spectrum of medical specialties to focus on identifying what the most common comorbidities are and how to expand the treatment algorithm to include them. 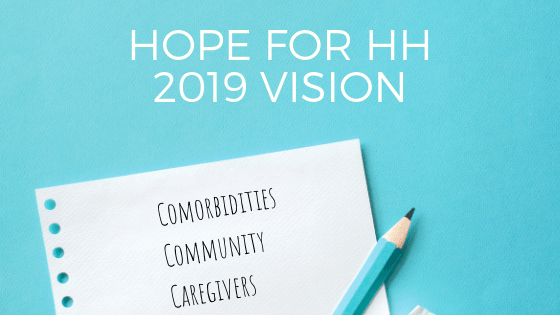 In anticipation of the event, Hope for HH will be sending out a survey to patients and caregivers in order to identify as many comorbidities and their prevalence in our population. We intend to share that information with the conference attendees to encourage discussion and collaboration. With such a geographically diverse population, many professionals only see a handful of HH patients and are not aware of just how many issues patients are facing on a regular basis – both pre and post treatment. There is often disagreement between professionals as to which symptoms are related to the HH, a recent treatment, or simply something coincidental. We hope to establish guidelines and encourage new research to answer those questions. Keep an eye out for the survey in the next couple of months – this is where patients and caregivers have a unique opportunity to influence the course of treatments available for HH. With your input, we can provide professionals with data they can use to expand their knowledge and improve treatments across the spectrum of care. The Second C is Community. Hope for HH has always had a global focus – but this year we want to expand our outreach and engage a truly active and involved international community. As with any rare disease, there is power in numbers. Our collective voices are what is needed to continue to advocate for better treatment options internationally as well as identify all the challenges our loved ones face. That means getting a proper COMPLETE diagnosis and the appropriate treatment, as close as possible to where we live. We hope to identify potential countries or regions that have HH patients that do not currently have access to information on HH or treatment locations and find a way to provide that critical support. The Final and perhaps most challenging C is Caregivers. I say challenging because it has been our experience here at Hope for HH, that we are really good problem solvers, but not always the best at setting the example by taking time to support our own needs! I am sure many of you are smiling as you read this – perhaps even a mumble of “but who has the time”? The best reminder I get is when I get on an airplane and the flight attendant says the bit about “When the oxygen mask drops down, place your mask on first, before helping your child”. I am an airline pilot’s wife and I still mumble under my breath – “Yeah, like that is EVER going to happen”. But it is true in life just as it is during an emergency in flight! I hope more of you will take up the challenge for 2019 to support your needs and help us help you. We will be sharing resources and suggestions for caregivers and we hope you will MAKE the time to focus on your needs whenever possible. Finally, the Board of Directors at Hope for HH would like to share a huge Thank You to all our volunteers and donors that have helped us over the last 10 years! We all can be proud of the work that has been done and the advancements in HH treatments and awareness worldwide! There is still plenty to be done and it will take an engaged and involved community to drive research and awareness forward. I hope any of you that are interested in being a part of the next decade of change will contact us at info@hopeforhh.org. There are lots of opportunities, both large and small, for individuals to join us and make a difference.